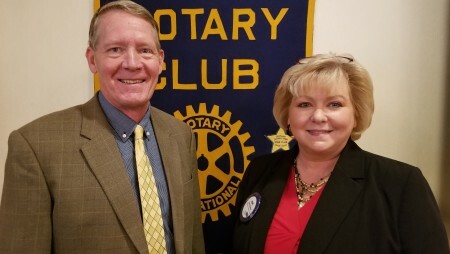 On Wednesday, Jan. 16, the Auburn Rotary Club welcomed City of Auburn Public Safety Director Bill James, who spoke to Rotarians about the city’s new public safety complex. The complex will be around 70,000 square feet and will house a new fire station, public safety administration, the police division, municipal court and city council chambers. Pictured with James is Club President Hope Stockton. The Auburn Rotary Club meets each Wednesday from noon to 1 p.m. at Saugahatchee Country Club. For more information about the Auburn Rotary Club or how to become a member, visit www.auburnrotaryclub.com.